We all have childhood memories that stand out with that mix of melancholy bliss. 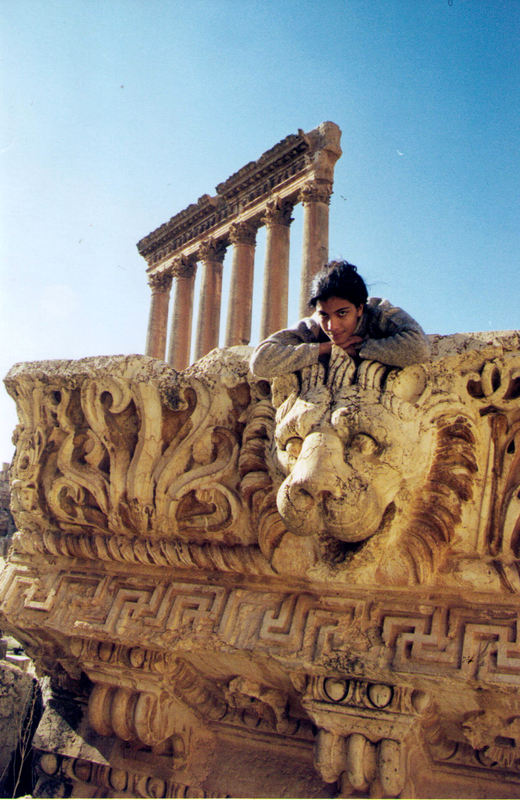 Mine of Baalbek are among those, probably because it’s in those memories that my father, now dead 40 years, seems so alive whenever I remember him from the rare times we went to Baalbek, his broad shoulders and dark eyes engulfing his Pentax cameras as he’d go about shooting the ruins like each Corinthian column was a supermodel: He was a professional photographer. Lebanon was his studio. 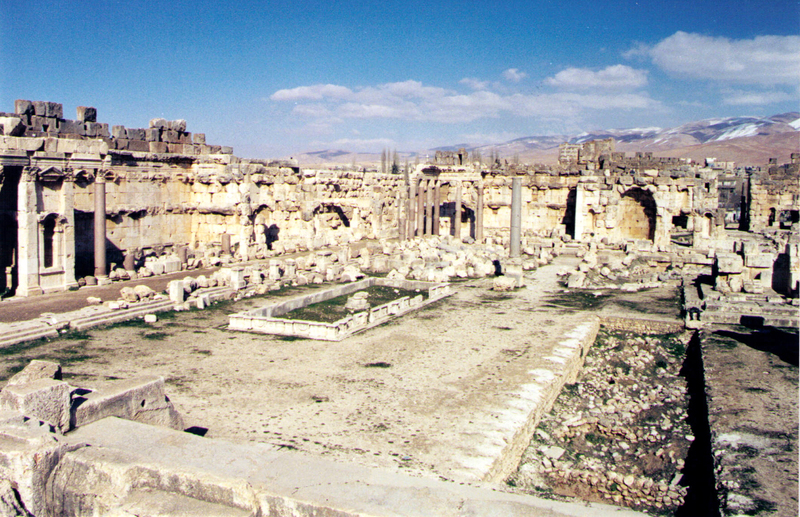 We discovered the country’s Greek and Roman and Phoenician and Crusader and Byzantine ruins through his eyes. The country was getting ruined again when he died. 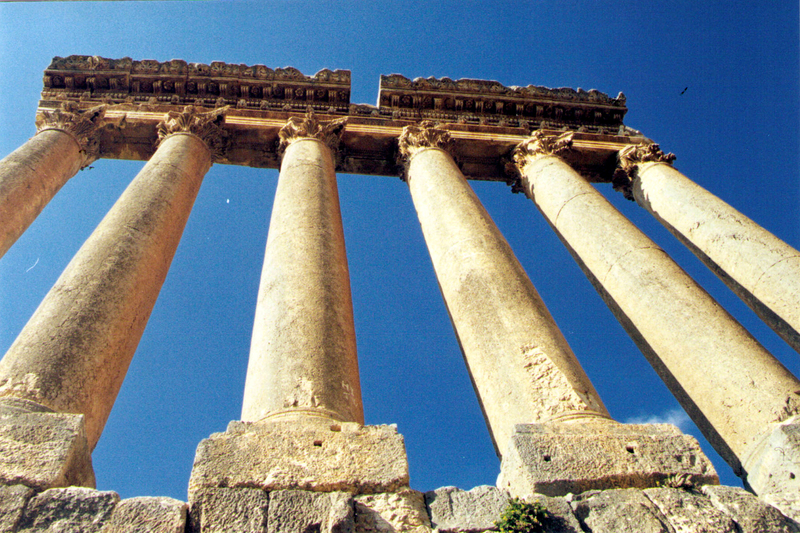 Growing up in Beirut, Baalbek (where Saladin grew up) seemed as distant and wondrous a place as Rome must have seemed to Romans living it up in Baalbek when they ruled the place and its palatial temples two thousand years ago. 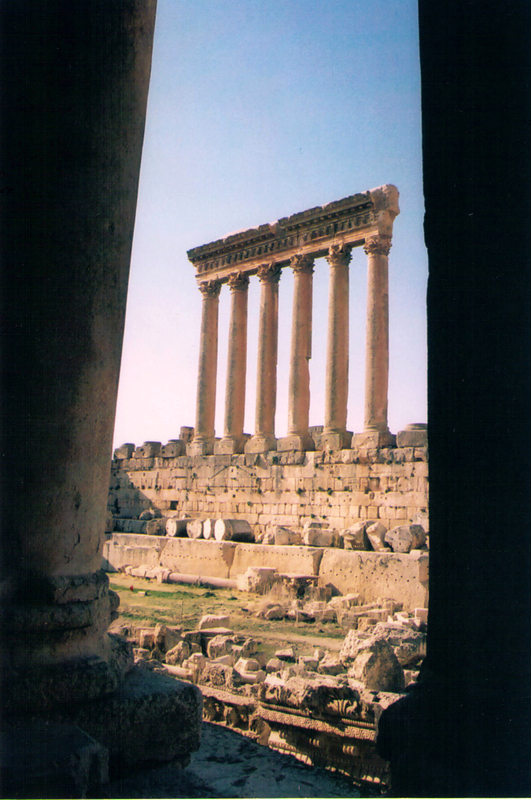 I think Baalbek meant something to my father more than other places. 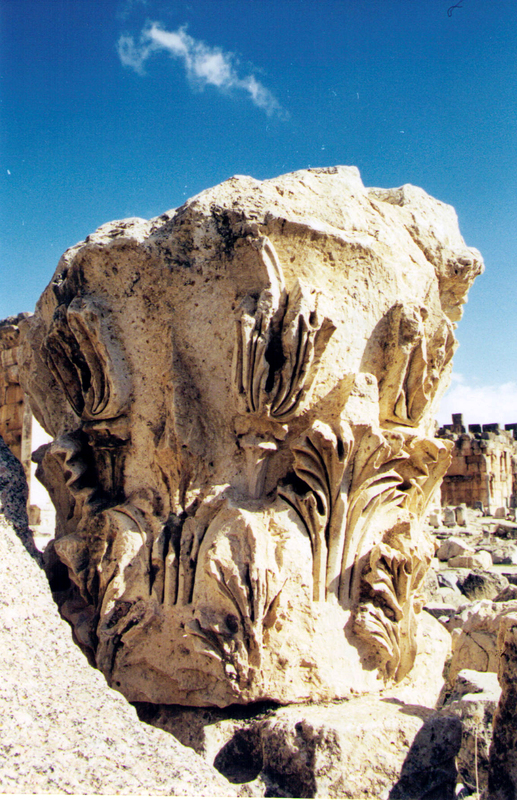 Maybe I’m imagining it because Baalbek meant something to me more than other places, because there, Jupiter was my father. It’s a shame that everything tender one says about these places—Baalbek, Tyre, Sidon, Beirut—must be prefaced by a disclaimer. The affection recounted here shouldn’t be confused with affection for whatever militant faction controlled the place then or controls it now—Syria, Hezbollah, Israel, Palestinians. 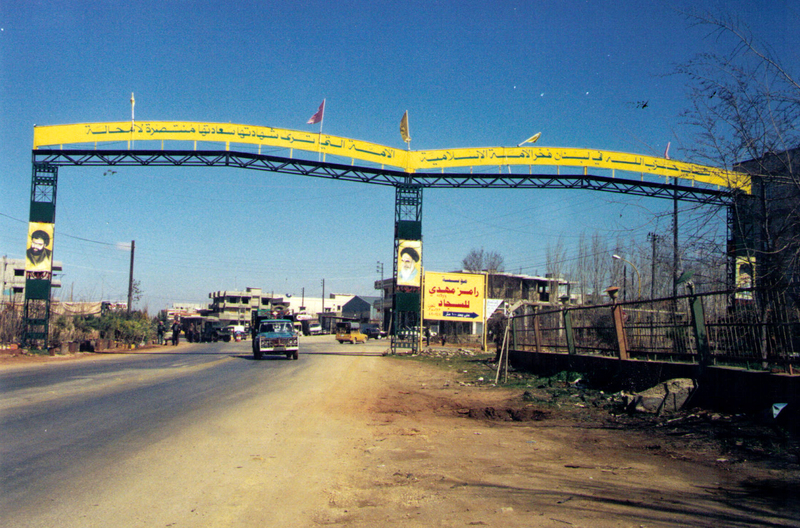 These memories span a long period dating back to a time when Hezbollah didn’t exist, all the way up to a time when I wish it never had. 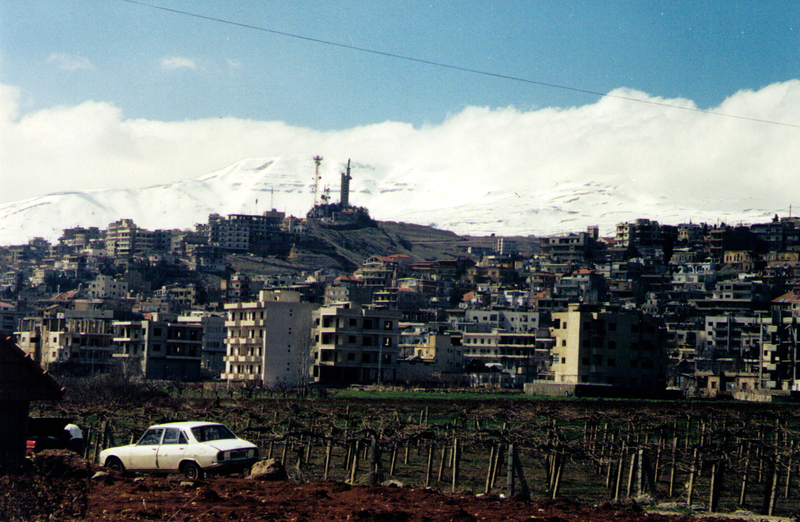 They span geography and time that stand apart from the effluence of the political and the ordinary, that particular mixture of sorry bedlam that bobbles Lebanon still. 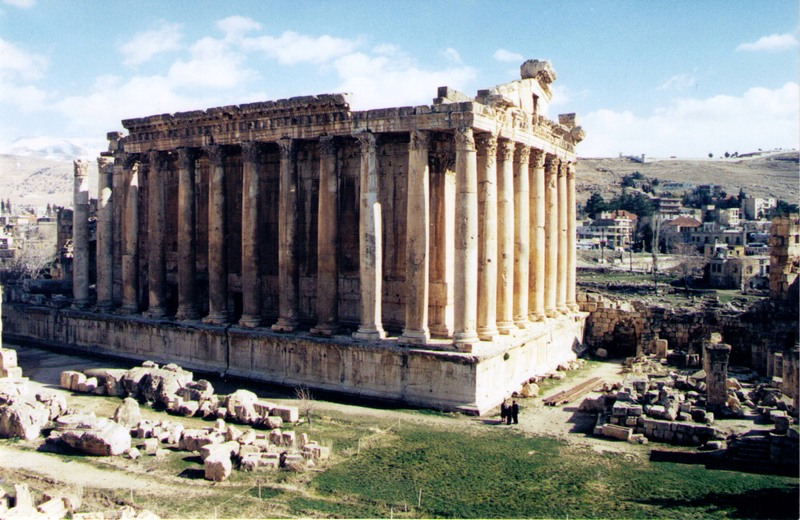 It’s only a two-hour drive from Beirut to Baalbek. The roads are twisty. 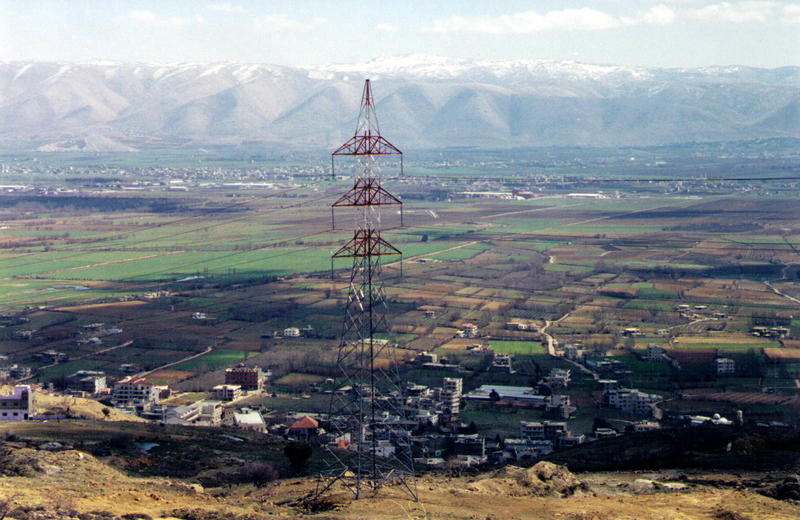 Distances in Lebanon aren’t what they are in Europe or the United States. A kilometer there feels like 10 here. Lebanon’s roads, sometimes guessed more than paved, often unmarked or barely imagined, lengthen distances the way Scheherazade would lengthen her tales by coils and turns that could leave you exhausted by the time you reached your destination. 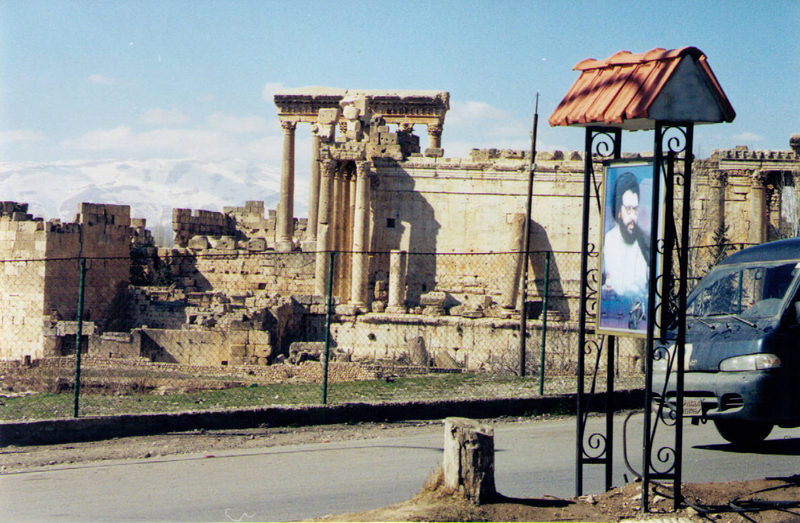 So trips to Baalbek were rare. 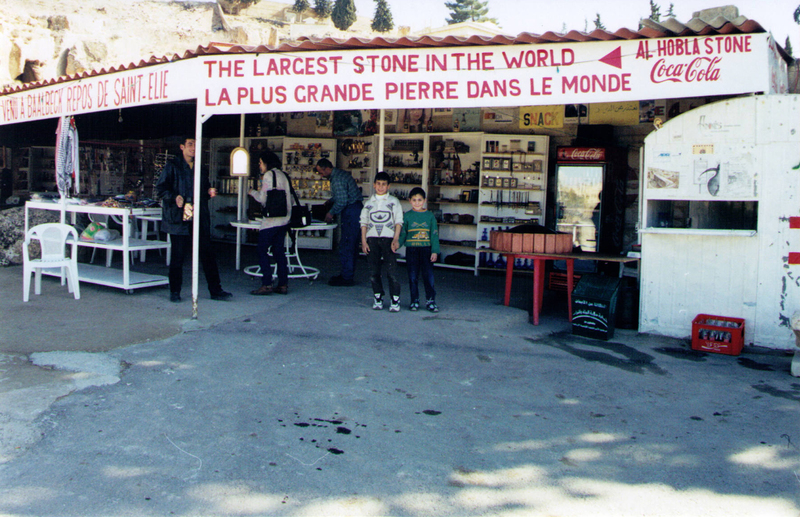 I doubt I went there more than twice or three times in all those years before I left Lebanon in 1978. We’d talk about a trip for months, and finally, we’d go. We looked forward to the drive my two brothers and I, in my father’s Citroën (one of those superb DS 21 that could hydraulically rise a foot or so and become an all-terrain vehicle before the inelegant age of SUVs), with Radio Monte Carlo blaring in our ears and my mother’s mane-length hair in our eyes: there was no air conditioning, only wide open car windows, Tom Jones singing “She’s a Lady” and a stop or two along the way, to stretch out anticipation. 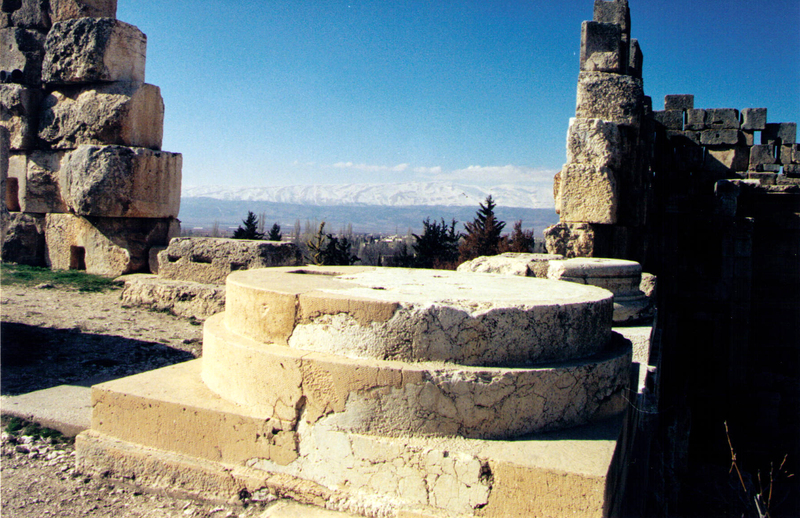 Then from a distance in the Great Plains of Lebanon that’s the Bekaa Valley, we’d glimpse the famous six columns of Baalbek against the blue sky and the snows at the crest of the Anti-Lebanon Mountains, if it was still spring (“the turrets glittered from afar,” in Edward Gibbon’s words). [A]n ample space was covered with public and private buildings; and the citizens were illustrious by their spirit, or at least by their pride; by their riches, or at least by their luxury. In the days of Paganism, both Emesa and Heliopolis were addicted to the worship of Baal, or the sun; but the decline of their superstition and splendour has been marked by a singular variety of fortune. 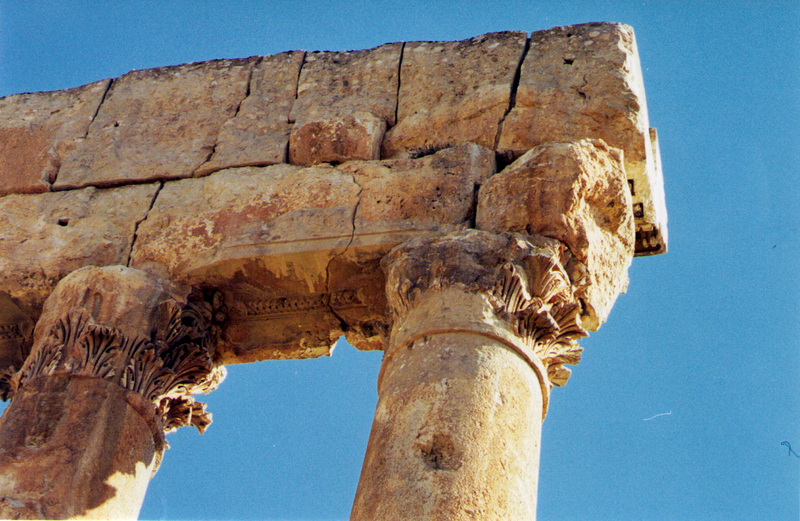 Not a vestige remains of the temple of Emesa , which was equalled in poetic style to the summits of Mount Libanus, while the ruins of Baalbec, invisible to the writers of antiquity, excite the curiosity and wonder of the European traveller. 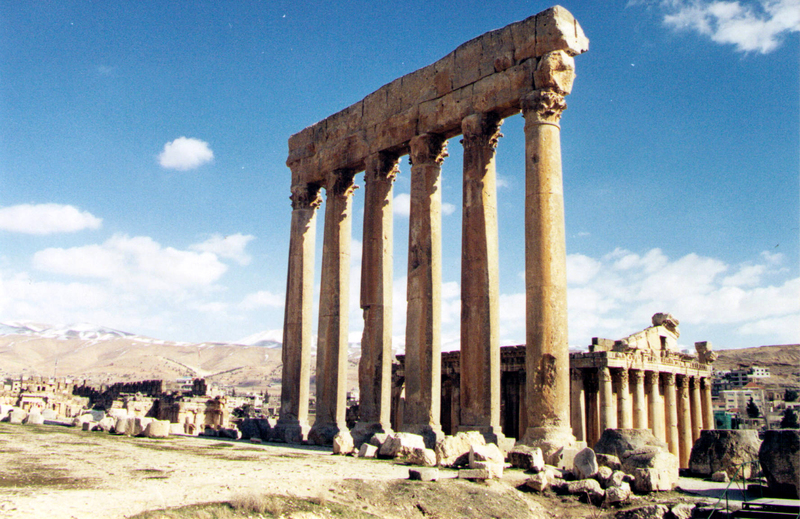 The measure of the temple is two hundred feet in length, and one hundred in breadth: the front is adorned with a double portico of eight columns; fourteen may be counted on either side; and each column, forty-five feet in height, is composed of three massy blocks of stone or marble. 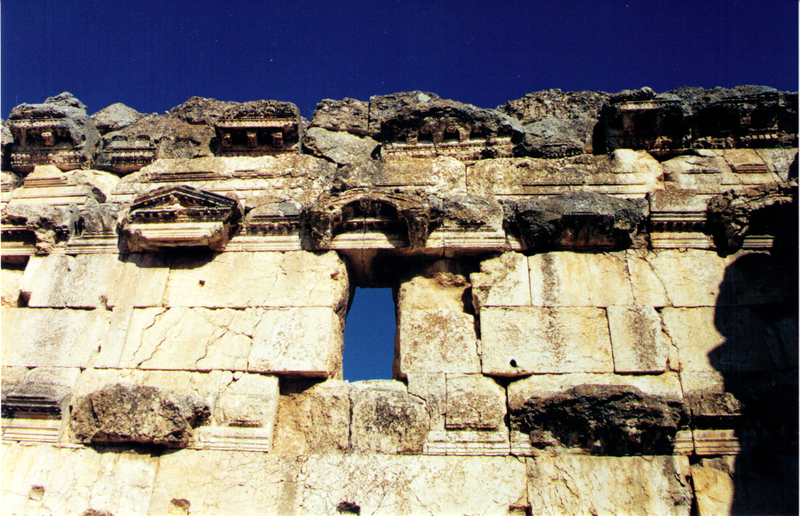 The proportions and ornaments of the Corinthian order express the architecture of the Greeks: but as Baalbec has never been the seat of a monarch, we are at a loss to conceive how the expense of these magnificent structures could be supplied by private or municipal liberality. 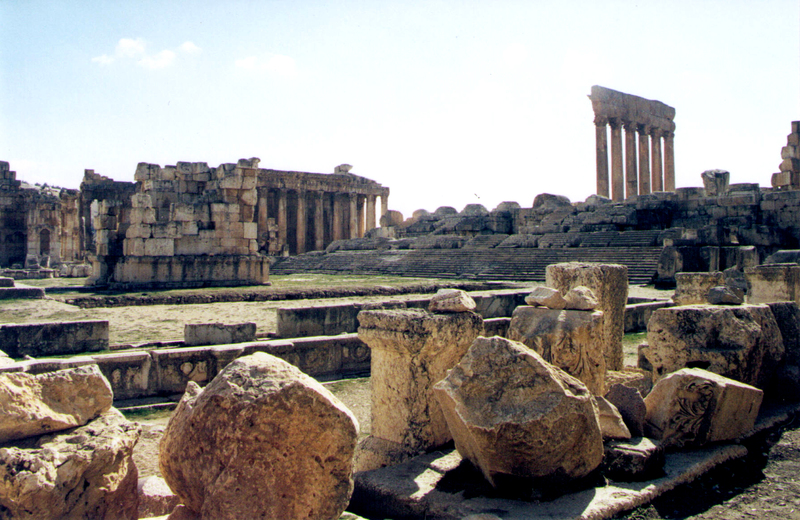 The ruins in Baalbek aren’t cordoned off. Visitors can walk through them like it was a Roman version of the Hirshhorn Museum, freely touching the stonework. The site takes several hours to see, several days to appreciate. The grounds are littered with massive stones, what’s left of the earthquake and what hasn’t been worn away. 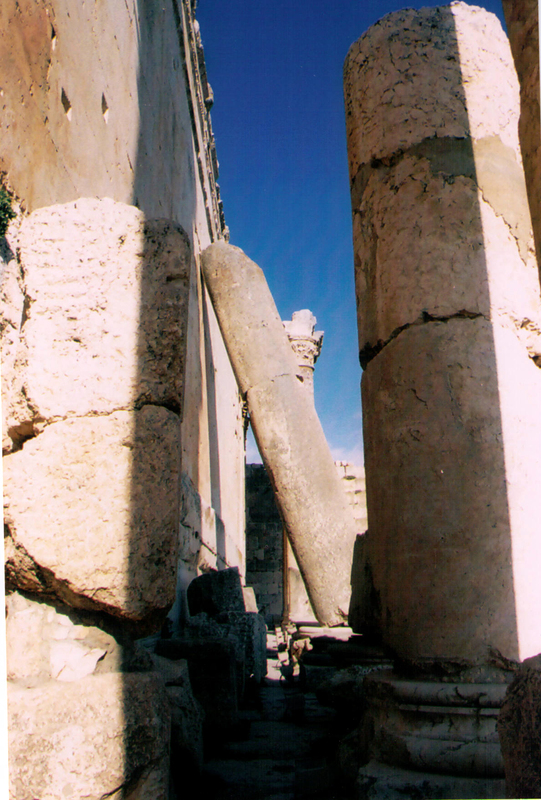 Nothing but the Temple of Bacchus and the famous six columns of the Temple of Jupiter still stand. It’s a wonder these stand still. My father would linger about them, shooting from every angle, standing between the columns for the perspective they afforded on the Temple of Bacchus, the God of wine, roofless but so remarkably preserved that for many years it doubled up as one of the concert halls of the annual summer Baalbek International Festival (and does again). My father’s patience for the right light and angle exceeded ours but I don’t remember either him or my mother restraining us from running all over the place. Where could we go wrong? The gods were dead. I had two favorite places. 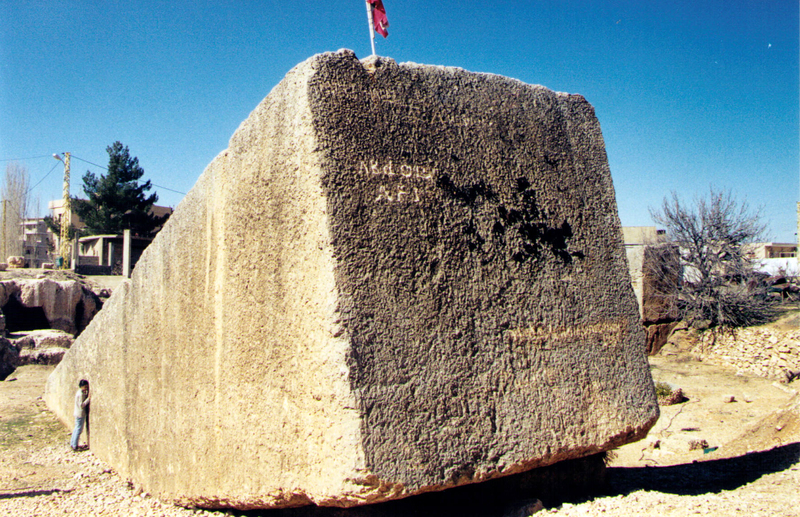 One was in town, in a cavity of ground as if formed by the monument there: what its keepers then as now refer to as the world’s largest single stone. 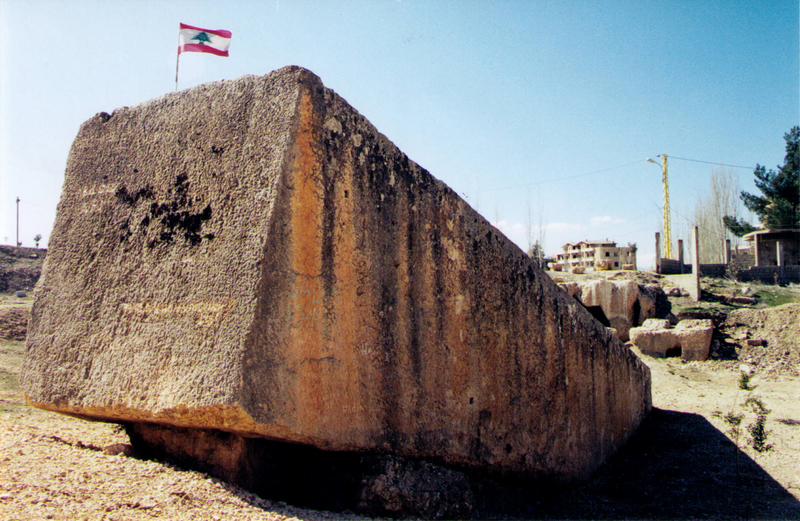 It is enormous, rectangular, chiseled and inexplicably jutting from the ground at an angle. What it took to get it there, where it came from, how many backs it broke on its way there: mysteries, like that scene in Close Encounter of the Third Kind where the French scientist goes to the Mongolian desert to see an enormous ship that had dropped there. 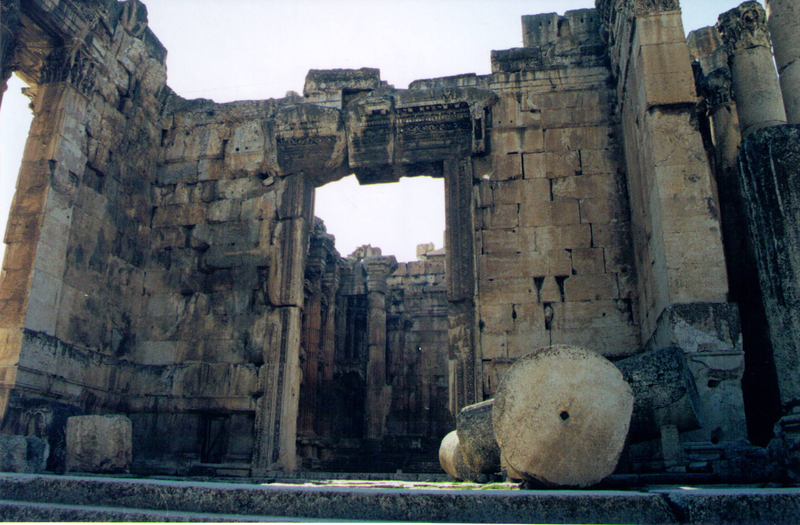 My favorite place in Baalbek was on the threshold of the Temple of Bacchus. 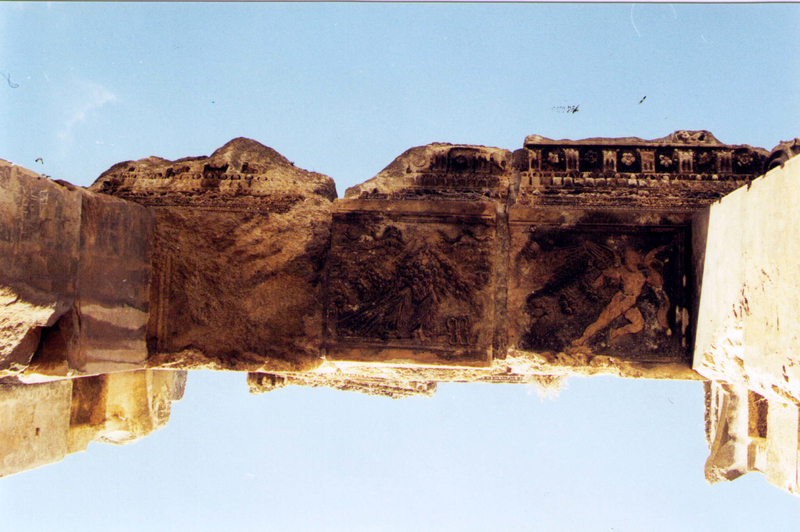 The entrance’s overhang is still there, intact. 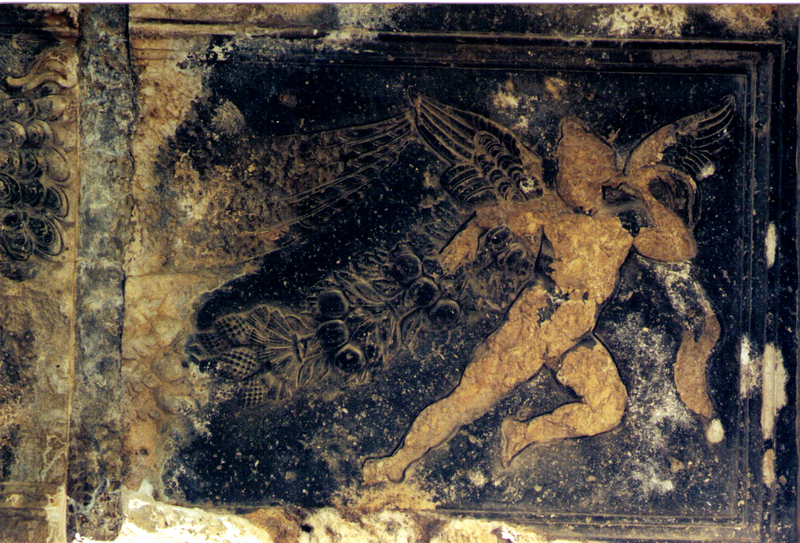 If you look up, you can see in distinct details Bacchus, god of wine, trailing a trove of grapes. 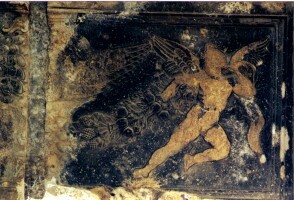 My father had once pointed out the image to me as he told me of the grapes and wines Bacchus would drink. 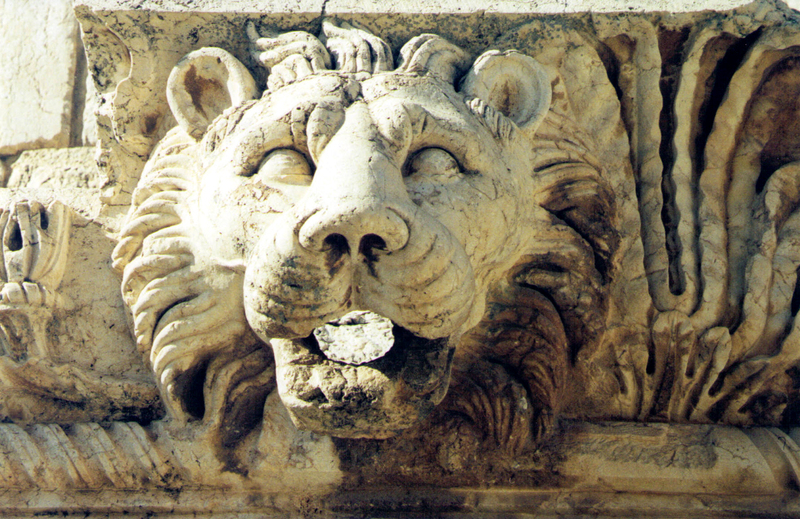 The image stuck with me since, etched in my memory as it is in that roman stone where, face down, it has weathered rains and snows and winds so well. 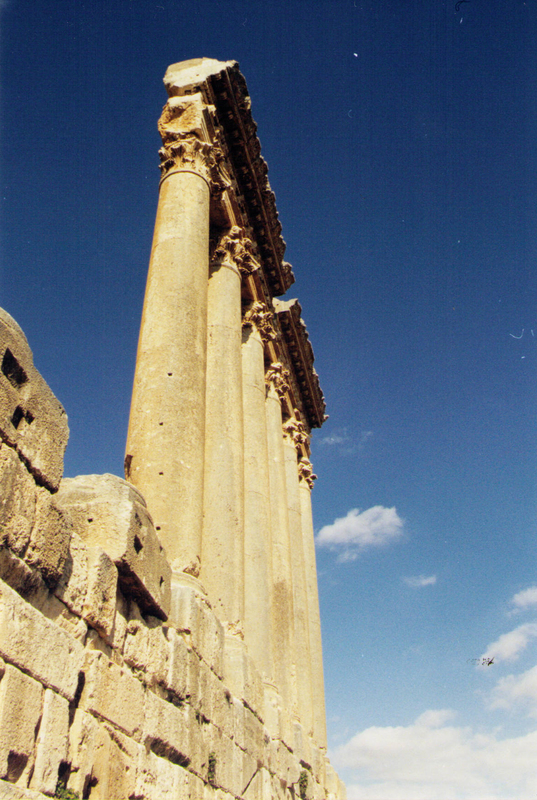 When I returned to Baalbek during the winter of 2000, the entrance to the temple was the first place I went to see. I needed to verify my childhood’s marker. My mother by then was already losing her mind. I could never be sure when I’d start losing mine. I stood there a moment, not looking up: what if it had all been a trick of time and embellishments? As we age our memories owe more to invention than fact, and to myths when our parents are the memory. They replace our dead gods. Then I looked. It was there. Exactly as I had remembered it down to the Rembrandt-like color contrasts. Time vanished. It was as if my father was standing with me, pointing all over again to Bacchus trailing his grapes, the dark-shaded hue of the aged stone around him looking like the wine-dark sea of an epic memory not even Homer could have rhymed more poetically with my father’s breath. What a very special piece for Father’s Day, your father would be proud of you! Thank you for sharing such a vivid glimpse of your history! We are all children of the Earth. To identify with a special place, whether it be a long lost temple one followed there father to, an historic battleground, monument, or city, or a backyard where weeding the rose bushes while my dad prunned and gloated over his American beauties, to have have had the time beside our fathers, while they are with us, has no equal in our memories. It is or was our privliedge, like it is our duty to our children to provide the times. That time is a gift of life the Earth makes possible. When I was nine I started working in father’s office on Saturday mornings do errant sweeping, dusting, or straightening up his waiting room magazines. At noon he’d close his optometry practice and we’d drive for two hours to the eastern shore of Va, where he’d see patients until eight pm. For six years I’d make the trip and talk of all things comprehensible for an adolescent riding in the car with him, being company. Before midnight, we’d come in the front door and he’d hand over the ‘country folk’s payments. Always ones or fives, and more likely bags of fresh grown vegetables or blue crabs in lieu of cash.My mother frowned but understood. Years later, he’s always reminding me how being with him on those lonely Saturday drives meant so much and help keep him awake navigating our ’56 Chevy on dark two lane roads. Recently, the last three years, I’ve showed up at his door surprising him with a sack of St. John river crabs that he loves. This year I’m in Houston where we are babysitting our new grandson so my son can take his wife on there first getaway since the baby’s birth. A phone call to my dad will suffice today, because next week I’m heading off back to my home, and the place where my 90 year old dad will share more memories of the times we lived the bond of father and son. Pierre–wonderful story. Nice pictures too. Happy Father’s Day! 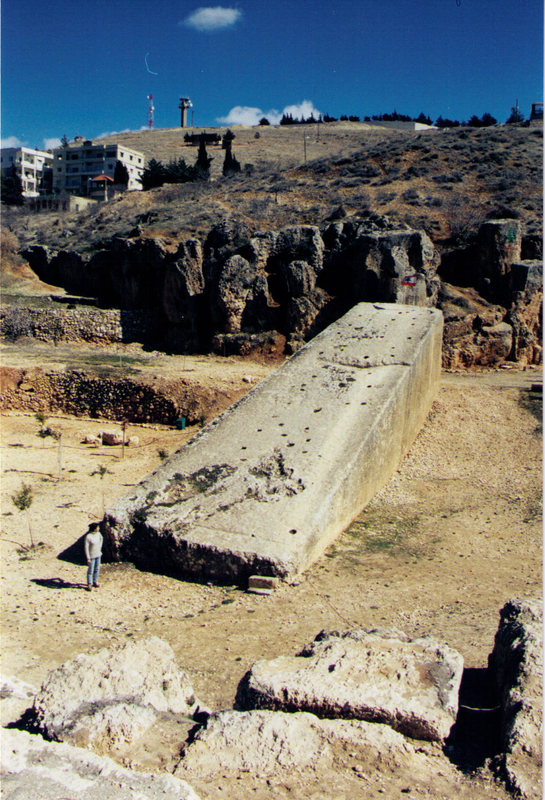 many school and Family trips to Baalbek, many memories comes to mind reading this article. I managed to visit again after 27 years that was in 2001 and i had the pleasure to share this visit with my 4 children and my wife. thanks Pierre, Happy Father’s Day! One of my all time favorites by you Pierre. 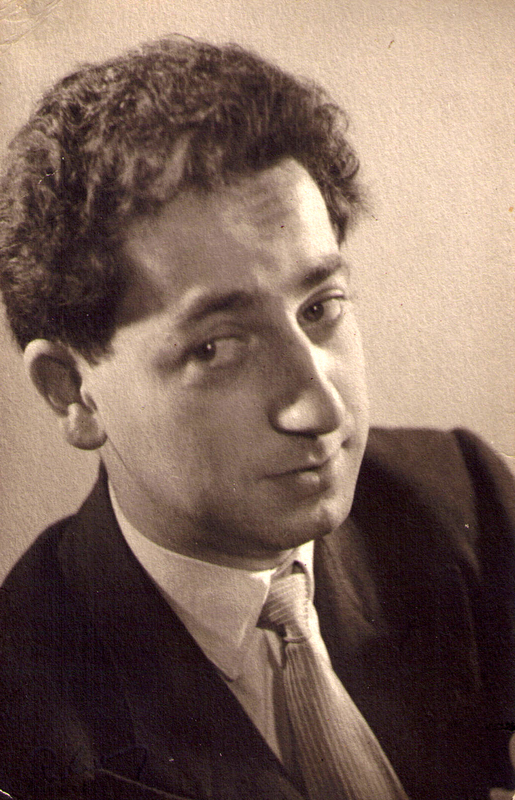 And I do believe Fouad, wherever he may be is smiling down on you, proudly. it’s hard to raise one who’d kiss stone… He’d done well. Fantastic tribute, Sir. 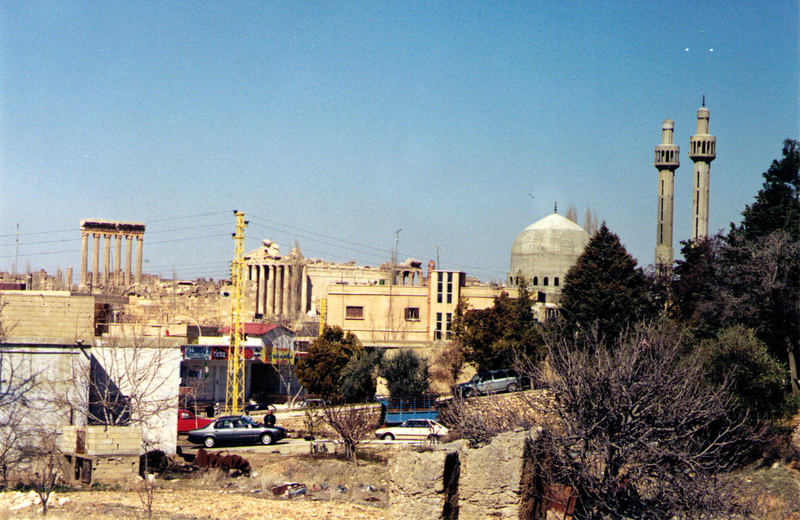 Pierre, a wonderful piece of writing about a historic place such as Baalabek. I admit I have never visited the place, but I have seen it when I was a teenager when we used to go to the Cinema in pre-1967 Jerusalem to see Lebanese films, mainly musicals featuring Sabah, Fairouz and others. Also on TV to watch musical plays and performances by Fairouz, Wadi’ Alsafi, Nasri Shams Eddine. 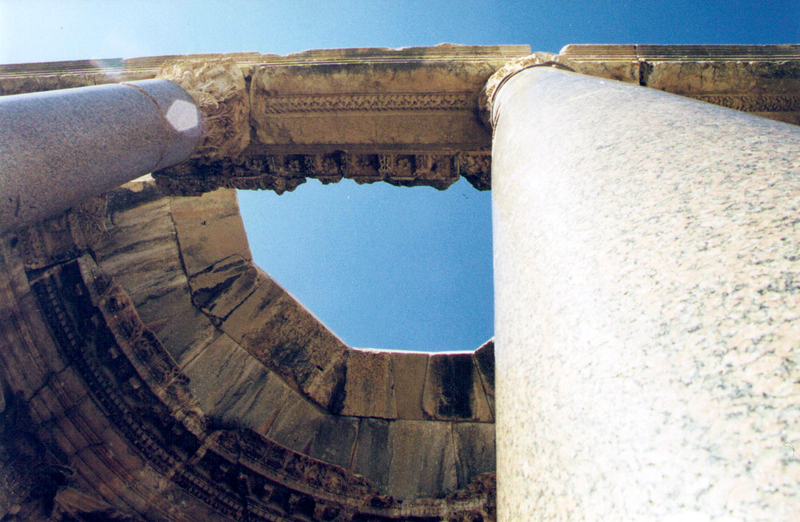 Jerash in Jordan which I visited some years ago is not dissimilar where an annual summer musical festival is held, Najwa Karam, Majeda al-Roumi and Milhem Barakat and many others take part. I think it is great that historical sites are used for cultural and theatrical performances to entertain the modern generations. Nostalgic and wistful Pierre; thank you for evoking thoughts and feelings life sometimes seem to want to rob us of . . .
Just like to add what a nice way to pay a tribute to your father’s memoryr and his favourite place. After all is said and done in this life, we are left with nothing but memories. an important memory for me. I agree with Jim Guines. It’s a nice piece of writing for father day. I’m sure your father is proud of you. not having met Mr. Fouad. He was after all, a fellow Pentaxian! I’ll bet he had a Spotmatic and other screw-mounts in his stable. Pentax and Takumar manual lenses, which I still use on a modern Pentax AF. You come from a line of creative people Pierre. What a great background–I also loved reading about your mother. Thanks for the article, and I too think that Dad would be proud of you. I’m so glad I found it this time around. As always, such nice writing. happy Fathers Day.